Robert Liparulo's novels, Comes a Horseman, Germ, Deadfall Deadlock, The 13th Tribe, and The Judgment Stone,have received rave reviews. His short story "Kill Zone" is included in the anthology Thriller, edited by James Patterson. 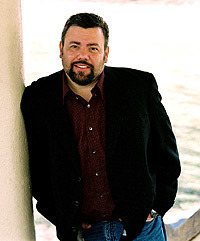 He is also the author of the best-selling young adult series DREAMHOUSE KINGS: House of Dark Shadows, Watcher in the Woods, Gatekeepers, Timescape, Whirlwind, and Frenzy. Robert lives in Colorado with his family. Robert Liparulo hasn't written any blog posts yet. We’d love your help. Let us know what’s wrong with this preview of The Firstborn by Conlan Brown. We’d love your help. Let us know what’s wrong with this preview of Demon by Tosca Lee. We’d love your help. Let us know what’s wrong with this preview of The Pawn by Steven James. We’d love your help. Let us know what’s wrong with this preview of Yahshua's Bridge by Sandi Rog. “If you can't turn off your thoughts, who cares how soft your pillow is?" What book would you like to read for the month of August? Thanks for the friend request, Robert. Thanks for befriending this fellow Goodreads author! Hi Linda. How are you doing?